There is the perception that custom cabinets are better made than stock cabinets. On more than one occasion I have had clients ask for custom cabinets in situations when they aren’t necessary. The truth of the matter is that how a cabinet is made has the biggest impact on the quality and longevity of cabinetry. The quality of the materials, hardware, and finish are the key to durability as well as construction methods or how the cabinet was built. There are many details, but most people can relate to the way drawers are constructed and how well they slide in and out. Everyone has come across that drawer that is coming apart or falling off the slides in a kitchen. Drawers can be put together with a number of different joints and materials. 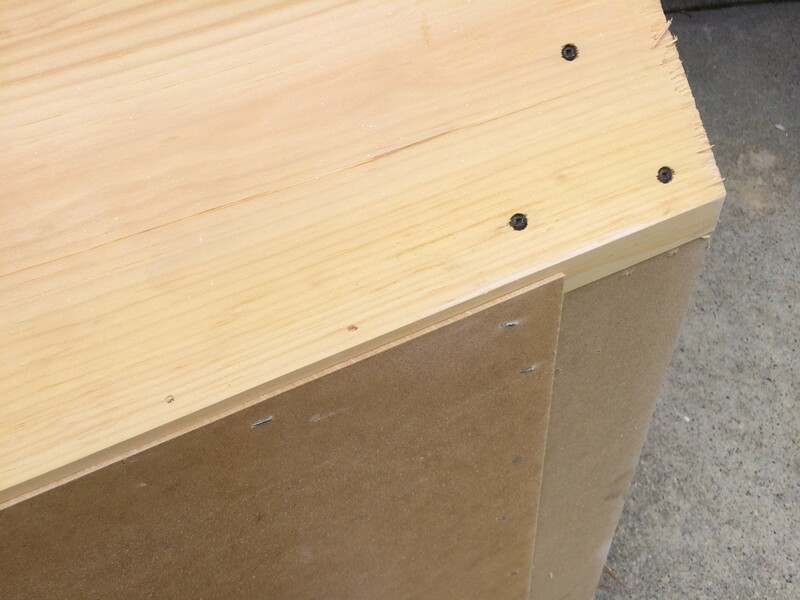 A stapled drawer made from fiberboard is significantly weaker than one constructed of solid 3/4 inch thick maple with dovetailed joints. And when children hang from the drawer or use the drawer pulls as steps to climb on the counter top, the stronger the drawer, the more likely they will survive undamaged. Good drawer slides are strong and will keep the drawers on the tracks when they are full and operating smoothly for years. What’s harder to see is how the cabinet box is constructed. It matters because with the trend of adding granite and solid surface counter tops to kitchens, the structure of the cabinetry is more important than ever. The box has to be able to support hundreds of pounds of counter top, the contents of the cabinets, and an adult when we sit on the counter. The picture is of a custom cabinet removed from a high end house that was around 10 years old. The cabinet box was made of 1/4 inch thick fiberboard/veneer sides and 1/8 thick backs held together with low grade pine boards. They may have been custom cabinets, but they were certainly not of quality construction.